When I first married, I started a Santa collection. It didn’t take me long to figure out that there wasn’t a lot of variety when it came to Santas. They were all pretty much wearing red suits trimmed in white fur, were fat with a long beard and twinkling eyes. 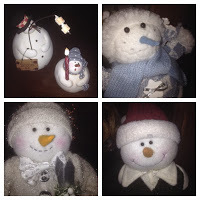 So I switched my collecting efforts to snowmen – and snowwomen and snow boys and snow girls. I have snowmen made out of square blocks and ice cubes. I have snowmen standing on their heads, roasting marshmallows, and decorating a moose with Christmas lights. I have snowmen with skis and snowmen with shovels. There are snowmen that blink and others that flicker. I even have a snowman dressed like a Santa. Each year when the time comes to pack away the Christmas decorations, these carefully selected snowmen pose a bit of a challenge. The Santas are easy – I just have to alternate their plump bodies in the box. Even though the snowmen come in all shapes and sizes that is not what challenges my packing skills. It’s their noses. All of the snowmen have one thing in common – carrot noses that stick out. As I carefully pack away the snowmen, I have to arrange them so as not to smash any of their noses. What a pity it would be if next December when I opened the “snowman” box, none of them had noses. I thought about all of the noses in our family that get bent out of shape for one reason or another during the celebratory Christmas season. We are often working so hard to do things for our family that we often forget to consider them. that I often get agitated and upset. My nose gets bent out of shape. 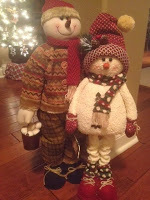 But this year, as I look at the snowmen around my house, they are more than just cute figures. They have a new meaning. They are a reminder for me. A reminder not to let my nose get bent out of shape. My snowmen can remind me of the true meaning of this season – the birth of our Lord, Jesus. Tell me. Does your nose ever get bent out of shape? Share the post "What Snowman Noses Taught Me About Holiday Cheer"